To investigate how participants in Wikipedia allocate their time, we created a visualization technique, the Chromogram, that can display very long textual sequences through a color coding scheme. The first three letters of a string determine color in a Chromogram. The first letter determines the hue; the second letter the saturation, and the third the brightness. Saturation and brightness were both kept in a restricted range so that the hue was easily perceived. Numbers map to shades of gray. Above is a sample of the color mapping to different words/numbers. Martin Wattenberg, Fernanda B. Viégas, and Kate Hollenbach. Interact 2007. 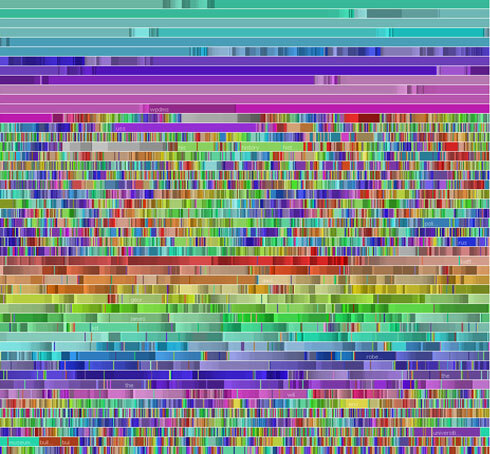 Chromograms visualize long sequences of text by mapping words to colors. As described at left, the color mapping encodes the initial letters of a word. As arbitrary as this approach may sound, it can reveal surprising and subtle patterns in real-world data. In 2006, working with Kate Hollenbach, we used this technique to study the editing activity of Wikipedians. Many Wikipedians engage in systematic activities: that is, a sustained related sequence of edits. Some editors seem to concentrate on particular topic areas. For instance, the image below shows a chromogram where the user focused on naval history. The dominant color is a purple shade that corresponds to the prefix �USS� (United States Ship) used in the names of American naval vessels. Occasional edits with a different color are evident, but exploration of the data shows that they remain on the naval theme. In other cases, users will give themselves a task that spans the most varied set of Wikipedia articles (that are not bound by title or subject matter). Often the organizing element of such self-imposed miniproject is a list of alphabetically-ordered articles that need attention--for example, articles that need stub sorting or re-categorization. When Wikipedians edit articles in alphabetical order, their edits show up as rainbows in Chromograms. The opening image on this page is actually a robot, not a human, programmed to edit a long series of articles in alphabetical order. Below, a Chromogram of a user whose edits are mostly about adding births and deaths occurrences to year articles on Wikipedia. In addition to confirming known patterns, such as reacting to vandalism events, Chromogram reveals a ditinct class of organized systematic activities that help shed light on self-allocation of effort in Wikipedia. For more details about this technique and our results, please refer to our Interact 2007 paper and our more extensive technical report.